There are probably as many opinions on what diapers are best for an adult baby or diaper lover as there are brands of diapers. Choosing the right diaper isn’t just a practical thing for a dad to an adult baby or little boy – there’s a whole set of emotions and preferences that will leave a boy giggling with pleasure or grimacing and acting fussy. Maybe he fits into large Pampers, gets a goofy grin when he sees a Bambino, or feels most comfy in cloth. My personal belief is that variety is a key to happiness and that it’s important not to narrow it down to just one brand – having a few choices on hand lets a dad decide what’s best, and he can adjust his diaper choice depending on the time of day, what activities are planned, and whether the mood better suits baby prints or plain white. But aside from having a cross section of diapers on hand in the nursery, another issue is keeping up your supplies. While buying on-line can offer more selection there isn’t always time, shipping can be expensive, and sometimes it’s more practical to just head to the local pharmacy. A diaper lover or adult baby has probably bought diapers for themselves in the past. More often than not, they’ve had to do this alone. There may have been a combination of embarrassment, excitement, and anxiety to their purchases. They may have been more focused on choosing a package of diapers and getting them home. They may have circled around the diaper aisle until it was empty and then quickly chosen a pack and tried to look calm and casual as they took them to the cash to pay for them (while inside their hearts were racing). So going to the store to get diapers with someone else, and in particular a daddy, can be a very new experience for a little guy. For a daddy, it’s part of the normal routine of life – his ‘son’ needs diapers, and he needs to go and get them for him, it’s as natural as a hug in the morning or a pat on a diapered bum as a boy heads out the door to school. But a dad should realize that his little guy may be experiencing a range of emotions and that taking him to buy diapers can be more than just an errand. Buying diapers for your little fellow isn’t like picking up toothpaste. Remember that to a boy, his diapers are an important part of who he is. With his daddy providing a safe and trusting environment, he has been able to acknowledge that he needs his diapers and that they provide an important sign of the fact that he’s a little guy who needs care and protection. They’re also one of the constants in the daddy/son relationship. There are lots of other constants of course – hugs, baths, bed time, or meals. But diapers provide a consistency to the relationship between you and your baby boy and they represent the gift he has given you – the gift of putting himself in your care. So treat buying diapers with respect and care. Take your time making sure that you’ve checked the different brands. Then, choose the right size and carefully examine the packaging to make sure it isn’t ripped or torn. You might even read the label – sometimes, diaper manufacturers put new information on the packaging and it can be worthwhile to check to see and to read it. If there’s a new brand, you might even take it off the shelf and show it to your little guy – a new type of diaper can be a big change for a boy and you want to check to see if there’s something he might be fussy about. In other words, take as much care and attention choosing the diapers as you would changing him. Your little guy may seem fidgety, impatient or anxious. He may tug at his shirt as if he’s trying to pull it down to cover his diapers. He may glance anxiously down the aisle. Don’t treat this as a sign that you need to rush – treat it instead as a sign that he’s simply looking for you to show the same calm assurance that you do in the nursery. Your role as a daddy is to make sure that the space in which he feels safe and secure in expressing who he is can grow and be protected. Shopping for diapers is as essential as breathing! Give him a little assuring pat on the shoulder or top of the head. Remind him you’re there to take care of him. You’re the one buying the diapers after all, not him – so this should give him a sense of safety and trust if you’re calm and proceed slowly. Often in the excitement your little guy might wet his diapers. I can often sense when this happens or, rarely, there may be a tell tale leak. Treat these circumstances as important bonding opportunities. 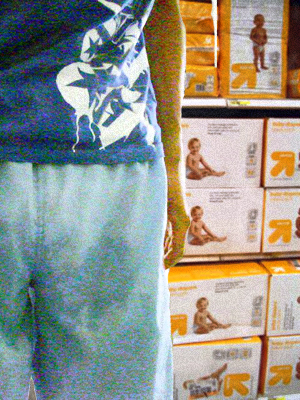 In the excitement of buying diapers, he’s wet the one he’s wearing. He’ll make the connection on his own that your buying him diapers and his need to wear them are connected, creating a very special daddy/son moment. Maybe even give him a quick little diaper check. If he’s leaked, assure him that you’ll have lots of clean diapers soon, and will get him into a clean one just as soon as you get home. Finally, a word about employees at the pharmacy or medical supply store – they’re there to help! If you have any twinge of concern over talking to them, then this will show to your little guy. He needs to see that his daddy treats the fact that he needs diapers as just that – a fact. Asking the store staff for advice, assistance, or even querying whether they have any samples behind the counter shouldn’t be avoided. If the staff is surly or brusque it likely has nothing to do with the topic – it’s probably true of the store in general, and it’s probably best to find a new one. Regardless, involving trained staff in giving advice – whether on diaper brands, dealing with diaper rash, or other topics just makes sense. Your little guy will see that you care enough to get expert opinions and that you have his interests at heart. I personally avoid having the diapers bagged – they’re usually easy enough to carry, and it’s better for the environment not to use plastic bags. As you leave the store and head home, realize that for your little guy you haven’t just run an errand, you’ve made sure that he’s well supplied with the diapers that he needs, that he’s thinking about the diaper change ahead, and that he has felt a special bond with his daddy because he no longer needs to buy his diapers on his own. I don’t know who you are or what you do for a living, but if your way of taking care of an AB/little boy is anything like these posts–I envy whoever that lucky AB gets to be! I also have to wonder, with the number of people who read this blog (there are many more than those who comment), if there will be waves of eager, desperate AB boys outside your door if they find out where you live. I wouldn’t do it, but you make this seem such a heavenly experience that it wouldn’t surprise me if it happens eventually. Any suggestions if you were doing the shopping online? Gosh you are such a good Daddy! I am envious of any boy you treat this way and love the fact you make the boy feel at ease. I would so love it if you made mention that you were looking for diapers for me and involve me in talking about the diapers too…how embarrassing it would be to discuss my diaper needs with a cute male clerk! Are you up for adopting a boy like me? Gigglez! KEEP up the awesome work! Thanks for givin this boy hope! Wow this is a really accurate article, and is written very well. It points out good tips but really shows what would or is going through a AB when they bought or is with a Daddy when he is buying them. Haha, I would most likely would do this, if this ever happens to me in the furture.